We would like to tell you about our logo. “代”, one of the Kanji in “代官山” Daikanyama, is located at the center of our logo. You can also find a flag, a golf club and a golf ball. Our goals are to be the store that people think of whenever they talk about golf stores in Daikanyama and to be the one loved by golfers. We at DAIKANYAMA GOLF CLUB will continue to offer quality products and services to improve your golfing experience. 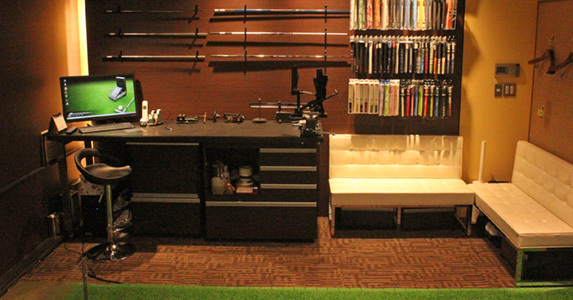 You can also enjoy our golf trial shot machine and select the best golf clubs, gear and clothes. There is a parking lot on T-site for your convenience. Also, We have started placing our products at DAIKANYAMA GOLF CLUB for foreigners traveling in Japan. Some of the purchase will be duty-free under certain conditions. Please to visit DAIKANYAMA GOLF CLUB for duty-free products. Regrip, Loft&Lie adjustment, Reshaft, inch adjustment etc… Please feel free to contact us. 5 minutes walk from Daikanyama Station. The shop is located across from Family Mart. There is entrance to the side of the Aloha table. Also, how to get to DAIKANYAMA GOLF CLUB in our Blog.